Housing demand is strong and supply is low. That’s been the story for a few years. But there is some early evidence that things could be starting to loosen up. That said, buyers shopping this spring will still face stiff competition. The lack of inventory combined with rising prices is encouraging some sellers to stay put; however, the move up market offers a bit more inventory. This combined with historically low interest rates creates a perfect opportunity for homeowners looking to move up. 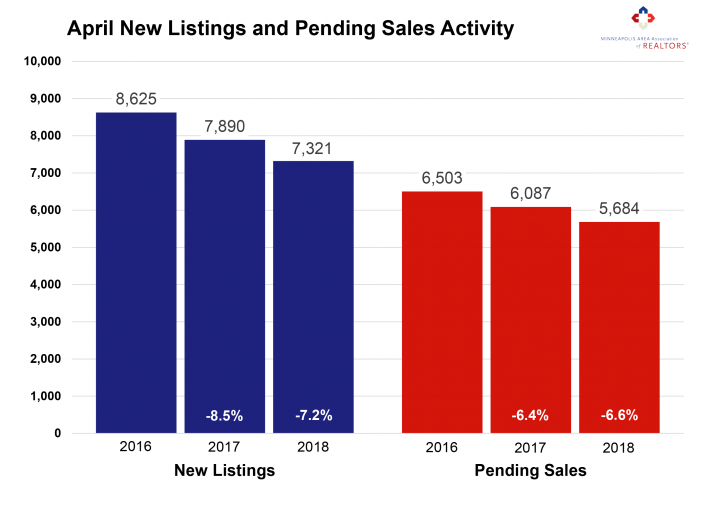 In April, sellers listed 7.2 percent fewer homes on the market—the sixth consecutive month of declines compared to a year ago. Largely due to the shortage, closed sales declined 5.2 percent compared to the prior year. For-sale housing inventory was 25.1 percent lower than April 2017. This shortage, which is particularly acute at the entry-level prices, has created a competitive environment where multiple offers and homes selling for over list price have become more common. Sellers are often receiving strong offers close to their original list price quickly, which can sometimes frustrate home buyers. New construction closed sales rose 13.2 percent compared to last April. Although single family homes made up about 73.0 percent of all sales, townhomes and condos have seen stronger demand lately. Similarly, previously-owned homes made up about 90.0 percent of sales, but new construction showed a much stronger increase in pending and closed purchase activity. The average time on market is still 53 days, reminding sellers that they still need to stage and price their homes well.